As has been the case with the past three Combined Joint African Exercises (CJAX), this year’s iteration is again led by the SA National War College. This is working not only to greater integration within the Southern African Development Community (SADC) military community but also with an eye on integration into the African Union’s African Standby Force (ASF). CJAX 2013 is a highlight of the military academic year at the College based on the western side of the Pretoria CBD with College Commandant Rear Admiral (JG) Patrick Duze terming it “our flagship”. Chief instructor Colonel Sean Stratford has split the locally based 71 officers, along with eight based in Gaborone (Botswana) and Lusaka (Zambia) into four syndicates. They include senior officers from the SA Police Services and Department of Correctional Services along with non-government organisations such as the International Committee of the Red Cross (ICRC) and the UN Office for the Co-ordination of Humanitarian Affairs (OCHA). Their task is to stop conflict in the imaginary African country of Coara and put plans in place to rebuild civilian, military and political structures. 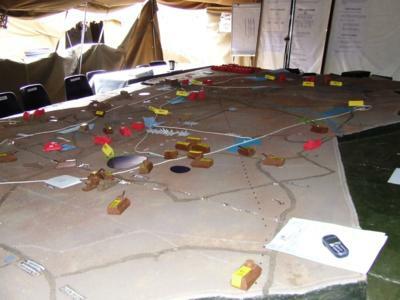 “Our scenario is based on actual events in African hotspots with the emphasis this year more on the civilian side rather than the military as it has been in past CJAX exercises,” Stratford said at the start of the exercise today, adding that co-operation and collaboration between the military, other government departments and entities as well as the military/civilian interface was being prioritised. The classroom-based exercise, apart from improving military skills in a complex peace support operation, also forges common understanding and inter-operability between the countries involved. “While participants are from SADC countries, the ASF is also part and parcel of CJAX 2013,” he said. “It is my sincere hope that when this CJAX ends on Friday all participants will have contributed to find ways and means of saving Africa from devouring itself,” Duze said ahead of work starting in earnest.